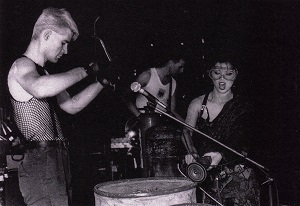 Tune in to Club It To Death with Peter from midnight on the morning of Wednesday March 29 to hear a special broadcast of legendary industrial/synth group SPK, recorded live at the Seaview Ballroom on January 28, 1984. SPK formed in Sydney 1978, and relocated to UK in 1980 (with varying members). After touring throughout Europe and the UK in 1983, they momentarily returned to Australia for a string of shows. Taken from the PBS reel-to-reel tape archive, this recording has not been aired since. This unique document captures SPK pursuing a more accessible synth-pop sound, shaking off the discordant avant-noise of earlier output. Listen in to From The Vault featuring SPK on Club It To Death – Wednesday March 29, only on PBS.